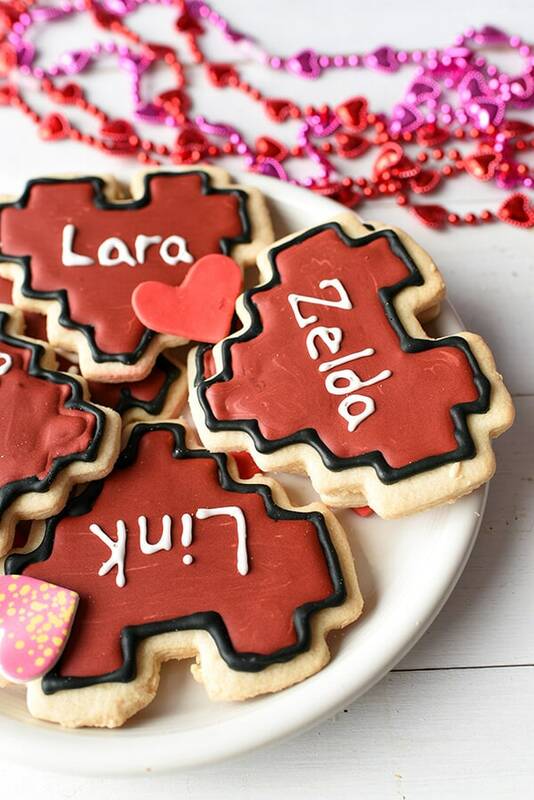 These 8-Bit Valentine Cookies have stolen my heart! And, these heart-shaped cookies are much easier to make than they look. They’re made with Rosanna Pansino’s 8-bit heart cookie cutter and topped with classic royal icing. Which, unfortunately, doesn’t instantly turn you into a queen. 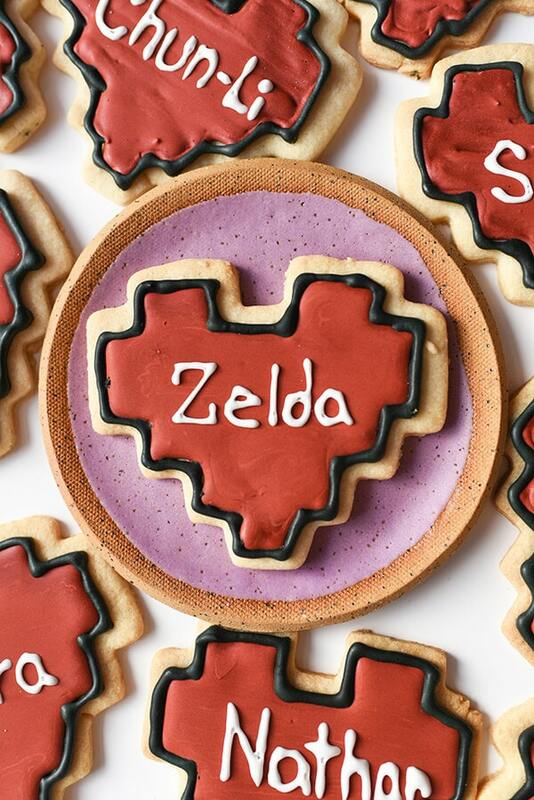 I grew up playing video games and these 8-bit heart cookies represent not only my love of gaming, but my fondness for Valentine’s Day… the holiday everyone else I know seems to detest, despite all the cards filled with the best cheesy puns. Since Valentine’s Day is a cheesy holiday (and that’s part of what I adore about it), I doubled down and embraced it with these 8-bit heart valentine cookies. Each is an ode to one of my favorite video game characters. These Valentine cookies are a classic vanilla sugar cookie topped with royal icing. They’re easy, but they do take a little time. They’re the second cookies I’ve ever decorated with royal icing and I think they look pretty good. That’s how you do a humblebrag, right? First, you’ll want to make the sugar cookies. Any sugar cookie recipe will do, though I used this one from SUGARBOMBE. The vanilla cookie base is delicious… or was until I added the royal icing. I generally think royal icing tastes gross, but especially so when you add food dye. That said, I still think these 8-Bit Heart Valentine Cookies make good gifts because your bae can display them as a token of your affection instead of eating them. And, if you spray them with shellac or clear lacquer once they’ve fully dried, they’ll last longer than your love. What? I mean forever, they’ll last forever. Make the cookies according to the recipe, roll out your Valentine cookie dough to 1/4″ (I rolled some to 1/8″ and that felt much too thin), then bake them on parchment paper until the edges are just barely golden brown. Let the cookies cool completely. Fit each piping bag with a coupler and a piping tip. Create red, black, and white royal icing. To make deep red and deep black, add a fair amount of dye to your royal icing. I added dye until the icing was saturated and no longer changed color when I added more dye. Then, I transferred the icing to a small bowl, covered it with plastic wrap and waited a few hours for the color to deepen. The black went from green to black and the red went from mauve to a Valentine heart red. When you’re ready to decorate, pipe an outline using red royal icing. Stay about 1/4″ away from the edge of the cookie so you have room to pipe the black icing on later. Keep your tip just above the cookie so you’re creating a line of icing that falls on the cookie instead of dragging the tip across the cookie. Then go back to the top of the heart and, working horizontally, fill in the cookie with icing. If you find there a few holes, simply pipe in some frosting or use the scribe tool. Let the red royal icing dry completely, then make an outline with black and pipe the desired name on with white! Let the cookies dry completely before stacking or sharing them. While you’re waiting for the cookies to cool, make super easy royal icing by mixing together meringue powder, water, and confectioner’s sugar. You want to make sure it’s not so loose that it goes everywhere but it’s not so stiff it gets stuck and breaks the bag. Ahem. In terms of icing consistency, for these Valentine Cookies, I used a consistency that was in between what I understand to be flood consistency and piping consistency. It worked well for both outlining the 8-bit heart, filling in the heart, and piping on the character name. If you lift the beater out of the mixer and there is a thin stream, that’s about right. If it feels too runny, beat in an additional 1/2 tablespoon of meringue powder and 1/4 cup powdered sugar. If it feels too thick, beat in 1 teaspoon of water at a time. Also, don’t be afraid to fix it if you find when you start decorating it’s the wrong consistency. If you look closely, you’ll notice you can see distinct red lines on some of the hearts. That’s because my icing was too thick. I put it all back in the mixer and added 1 teaspoon of water, which fixed the issue. 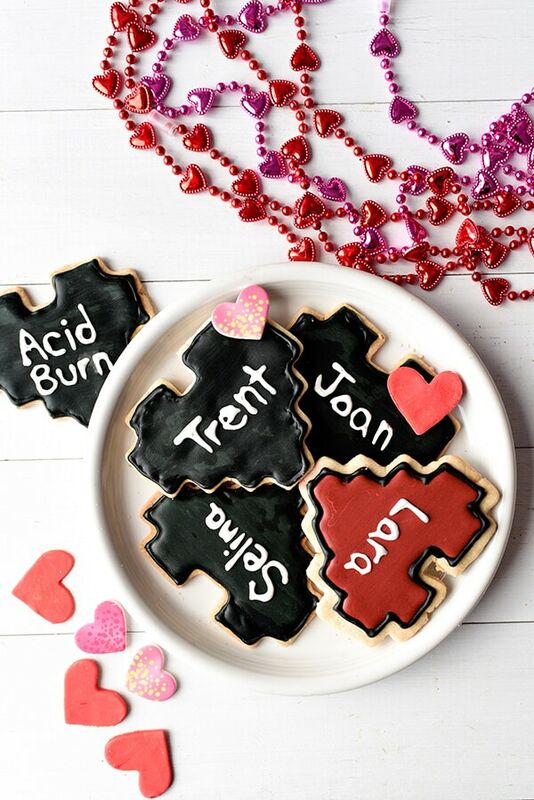 A few more Valentine Cookies… for the rest of my favorites growing up. 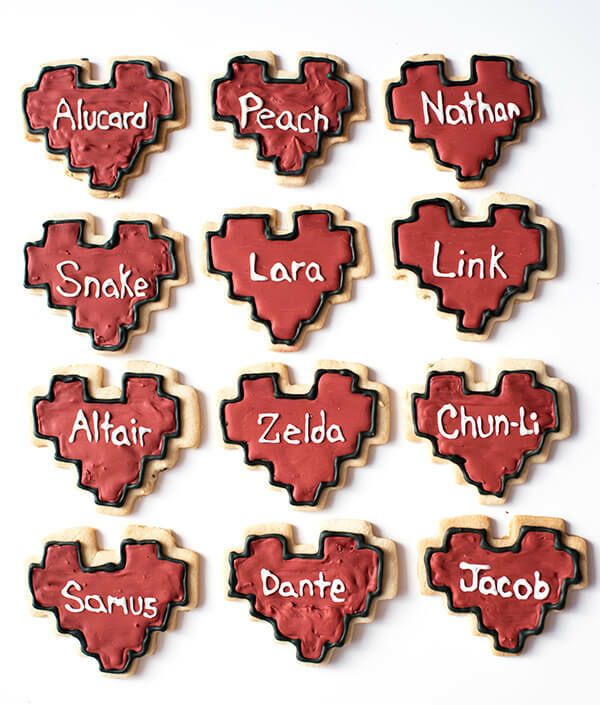 These 8-bit Heart Valentine Cookies pay homage to 8-bit video games and Valentine's Day! Make sugar cookies according to recipe. If you are using a recipe that requires the dough to chill, make the royal icing during that time. Roll sugar cookie dough to 1/4" thick. Cut out cookie shapes using 8-bit cookie cutter. Reroll scraps until dough is gone. Bake according to recipe until edges are light golden brown. Let cool. Combine meringue powder, water, and powdered sugar in stand mixer fitted with whisk attachment for about 7 minutes until soft peaks have formed. Separate royal icing into three bowls. Cover one bowl of undyed royal icing with plastic wrap. Set aside. Add red food coloring to first bowl until icing is saturated. Cover with plastic wrap and set aside. Add black food coloring to first bowl until icing is saturated. Cover with plastic wrap and set aside. Wait 2-3 hours until colors have deepened. Fit icing bags with couplers and #1 or #2 round tip. Fill bags with icing and use bag ties to close. Place tip covers on each bag. Pipe red royal icing outline around edge of cookie, leaving 1/4" space. Fill inside of outline with red royal icing. Let dry. Pipe black outline around cookie using black royal icing. Let dry. Pipe character name on cookie with white icing. Let dry. If you want to eat the cookies after they're decorated, I recommend adding a flavoring (vanilla, almond, etc.) to the royal icing. 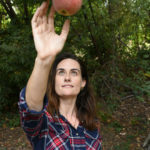 If you don't want to eat them but want to keep them, let them dry completely, the cover with clear lacquer or shellac. Too fun! I just watched the Nerdy Nummies video of these cookies with my daughter yesterday! We ordered these cookie cutters and can’t wait to make them together! These cookies are so fun! I love working with Royal Icing! Thank you! Would love any tips to make it taste just a bit better! I love the cookie shape so much! <3 What a cute and creative idea for Valentine's Day! Isn’t it fun? This design totally speaks to my gamer heart! These look incredible – the perfect gift for gamers for Valentines day!